Linda Brousseau, Saranac Lake High School, Saranac Lake NY and Tammy Morgan, Lake Placid Middle/High School, Lake Placid NY preparing a comet model. Water. It?sessential for life as best we know it. Almost three-fourths of the Earth iscovered with water. We live on the pale blue dot, and our lives depend fundamentallyon water. Yet, just after Earth formed about 4.5 billion years ago, the surfacewas mostly dry. ?So, where did the water come from?? asked a high schoolteacher this morning at the Astrobiology Summer Science Institute for Teachers(ASSET) here at San Francisco State University. It?s a good question that hisstudents are very likely to ask as they study the evolution of our planetarysystem. The quickanswer is comets. Some water wasalso released the rocky materials that coalesced to become planet Earth. About4 billion years ago, the Earth was bombarded by ice, rock and dust, which todaywe call comets and asteroids. Thecratered surface of the Moon records this bombardment. Comets aregreat icy snowballs of water, carbon dioxide and ammonia ices, organics(hydrocarbons), and dust. Roughly, they are 75% ices. We know this fromstudying comets that invade the inner solar system. We?ve studied them withspectroscopes on ground-based, airplane and spaced-based telescope to determinethe chemical composition. More recently, spacecraft have swept up particles andreturned them to Earth for analysis.We?ve also studied meteor showers?the delightful lightshows put on by naturewhen Earth plows through the debris shed by a comet. When Istand on the edge of the ocean, or fly across the Pacific, it seems incredible that snowballs from space could have filled the oceans. Given several hundredmillion years, it works. For most of us, it?s difficult to imagine the immenseamount of time involved. It?s simply beyond human scale. So, how can teachersmake planetary evolution and comets ?real? in the classroom? Thismorning, the ASSET teachers made comets. For the remainder of the day, we?vewatched them sublimate, hissing as gas escapes from their surface. They?veevolved from icy pristine snowballs flecked with dust, to dark cratered massesas the carbon dioxide escaped, and left behind the husk of the comet: dirt andorganics. This models what happens to comets that repeatedly visit the Sun.Ultimately, all that?s left is the dust and metals that generate meteor showers. With a nodof credit to Dr. Dennis Schatz, the original cometary chef, and Vice Presidentfor Education at the Pacific Science Center, here?s how to make a comet at homeor in your classroom. There aresome tricks to making a good comet. Work in a well-ventilated area. Dry ice releases carbon dioxide, which can accumulate in closed spaces. Plants are OK with excess carbon dioxide; people are not. 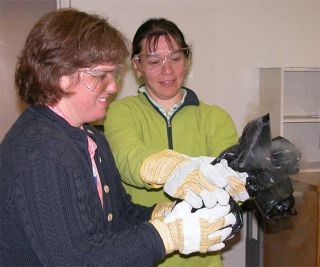 Wear leather work gloves to handle dry ice (to avoid frost bite). Wear safety glasses when making the comet. Display the comet in a well-ventilated area. Preparation:You?ll need to break up the dry ice into walnut-sized pieces. It?s easier ifthe dry ice has ?rested? a while in an ice chest. Overnight is OK if you?remaking multiple comets and have a large amount of dry ice. Otherwise, simplystore the dry ice in a small ice chest for a few hours.? Don?t latch the lid asthe sublimation of carbon dioxide will blow open the lid. Don?t put the dry icein the freezer?it?s too warm and the dry ice will sublimate away. Put dry iceinto a double plastic bag, and break up shortly before making the comet with ameat tenderizer or other hammer. Do this outside on the ground, not a floor orcabinet top as the combination of frozen dry ice and hammering will damagesurfaces. Put onsafety glasses and gloves. Line the large bowl with one garbage bag. Don?t openthe bag. Pour in 2 cups of water;mix in the dirt, ammonia, and hydrocarbons. Any cola drink is a good source of?hydrocarbons.? Mix with a long handled spoon until the water looks dirty, andall of the materials are wet. Add 2 cups of dry ice, and stir until the mixtureseems stiff?1 or 2 minutes. Lots of ?smoke? will crawl out of the bowl and sinktoward the floor?carbon dioxide is heavier than air. Gather upthe plastic bag around the comet, compressing the mass together. Leave theplastic bag open a little so that carbon dioxide continues to escape. (Don?ttwist it shut.) After a couple of minutes, open up the plastic bag and retrieveyour comet. Place the comet in the pie plate, and observe. You can use a hairdryer to blow a ?tail? away from the comet. The comet will change dramaticallyover the next few hours. The cometdoesn?t stick together. Usually, this means that you need a bit more water. Addwater to the mixture stir, and compress. The cometturned into a mass of suds. You used ?sudsy? ammonia, and the carbon dioxide ismaking bubbles out of every bit of soap in the ammonia. I did this once, andwhile it was very entertaining, my comet did stick together. My comet turnedinto many small comets, like Shoemaker Levy 9.? Use plain ammonia. Why dothis? It?s a reasonable model for the nucleus of a comet, and it?s a funproject that brings space down to Earth. As to the difficulty of comprehendingage of the Earth, we work with the scientific evidence and display the resultson timelines. The early bombardmentof Earth is at 4 billion years ago. ASSET issupported by the NASA Astrobiology Institute, the SETI Institute, and a Lockheed Martin Missiles and Space Systems in Sunnyvale,Sunnyvale. ?Voyages Through Time? was originally developed with the support ofthe National Science Foundation, NASA, Hewlett Packard Company, Educate Americaand the SETI Institute in partnership with NASA, California Academy of Sciencesand San Francisco State University.